This document is a technical summary of the Federal Highway Administration report, Long-Term Pavement Performance Program Determination of In-Place Elastic Layer Modulus: Backcalculation Methodology and Procedures (FHWA-HRT-15-036). This TechBrief provides an overview of the methodology and procedures used to backcalculate the elastic layer modulus from deflection basins for all test sections included in the Long-Term Pavement Performance (LTPP) database. Deflection data have been measured at periodic intervals with the falling weight deflectometer (FWD) on all rigid, flexible, and composite pavement test sections included in the LTPP program. These data are used to determine the load-response properties of the pavement structure and subgrade. Currently, there are 16,364 FWD testing days and more than 2,400 test sections in the LTPP database. Several years ago, the Federal Highway Administration (FHWA) sponsored studies to backcalculate elastic layer modulus values from deflection basins and included the computed values in the LTPP database. (See references 2 through 5.) Since then, the amount of deflection data in the LTPP database has increased substantially, especially for the Specific Pavement Studies (SPS) sites. Therefore, FHWA sponsored a follow-up project to revisit the methods used in the first round of backcalculation and to calculate the elastic layer modulus values for the deflection data that did not exist during the first round of backcalculation. The major goal of the backcalculation project was to determine the in-place elastic layer moduli from deflection basin measurements for the LTPP test sections and execute those methods for all flexible, rigid, and composite pavement sections included in the LTPP program. Another key goal was to automate the process and make it less dependent on the user so that others not directly involved in the development of the tools and procedures can recreate the results. One of the difficulties in backcalculation is that it does not determine a unique solution or set of elastic layer moduli for a specific set of measured deflection basins. More importantly, the quality of the results depends greatly on the expertise of the user in setting up the problem. In other words, different users can obtain different results for the same set of deflection basins. The non-uniqueness of these solutions has been a major deterrent for some agencies to take full advantage of backcalculation methods for routine rehabilitation design. In addition, many agencies limit use of the deflection data to only determine the subgrade elastic modulus. This TechBrief provides a general overview of the backcalculation process and summarizes the steps that were automated in calculating the elastic layer moduli from deflection basin data. It also describes the tools written to simplify the backcalculation process while taking full advantage of the entire deflection basin dataset for rehabilitation design in accordance with the MEPDG. (1) The automated process is specific to LTPP and the data tables included in the LTPP database. The activities presented here, however, can be used to improve the backcalculation of elastic layer moduli for any rehabilitation project. The backcalculation project resulted in the development of two major products: (1) a set of computed parameter tables (CPT) stored in the LTPP database and (2) analytical tools for the pre-and post-processing of the deflection basin data. A user's guide is available for executing the automated backcalculation process, as well as for the utility and software tools for organizing the results included in the CPTs. Non-backcalculated values table (the third column in table 1): This table includes general information on each test section analyzed through the backcalculation programs and compares the pavement structure included in the LTPP database to the structure simulated in the backcalculation process. It also includes the number of basins analyzed and the number of basins and stations with acceptable moduli, as well as whether a rigid layer is present. Backcalculated values from individual deflection basins (the first column in table 1): This table includes all results for individual deflection basins measured along a test section for all test dates. The calculated layer moduli, even those identified as errors, are included in this table. Test time and pavement temperatures are included in this table, as well as other factors that can be used to determine how the results are influenced from the different factors included in the backcalculation process. This information can be used to evaluate the stress sensitivity, temperature sensitivity, and seasonal sensitivity of the results. Summary of results or processed data (the second column in table 1): This table includes the average and standard deviation of elastic layer moduli along the test section on a test day basis. These values are the representative values for each test section that are layer dependent, test lane dependent, drop height dependent, season dependent, temperature dependent, etc. The averages and standard deviations were determined using the individual deflection basins not identified as an error. Table 1. Computed parameter tables stored in the LTPP database. Elastic layer moduli that are basin-specific from the EVERCALC or MODCOMP software packages for all test sections (rigid, flexible, and composite) included in the LTPP program. Average and standard deviation of the elastic layer moduli for a test day (all rigid, flexible, and composite test sections), lane number, and drop height. This set of tables excludes the backcalculation results that were rejected from the acceptance criteria. Backcalculation section information that identifies the number of basins used to calculate the elastic layer moduli and whether a rigid layer was included in the simulation. Elastic layer moduli from the BEST FIT method for test sections with PCC surfaces for bonded and unbonded simulations that are basin-specific. Average and standard deviation of the elastic layer moduli from the BEST FIT method for the bonded and unbonded simulations for a test day, lane number, and drop height for LTPP test sections with PCC surfaces. Structure used in the backcalculation process using EVERCALC or MODCOMP for a specific test day (layer thickness and material type). LTE for tests performed at transfer joints and crack locations that are basin-specific. Average and standard deviation of the LTE for a test day, lane number, and drop height for LTPP test sections with PCC surfaces. Structure used in the calculation process using the BEST FIT method for a specific test day (layer thickness and material type). CPT = Computed parameter table. LTE = Load transfer efficiency. LTPP = Long-Term Pavement Performance. PCC = Portland cement concrete. EVERCALC 5.0 was the primary program used for the analyses and was used for all data and all pavement types. The pre- and post-processing utility tools for the EVERCALC analyses were fully automated. The automation process included generating the input files based on pavement simulation rules, executing EVERCALC, and post-processing the results. MODCOMP 6.0 was used as the auxiliary program to backcalculate results for those LTPP sections that did not yield acceptable results with EVERCALC. The MODCOMP analyses were semi-automated as an iterative approach, and the simulated backcalculation structure was selected on a case-by-case basis until the results converged within the selected criteria. A few test sections or portions of test sections did not converge to produce satisfactory results even after multiple efforts using EVERCALC and MODCOMP. The BEST FIT procedure was used to analyze LTPP sections with a portland cement concrete (PCC) surface to obtain the subgrade k-value and the elastic moduli of the PCC and base layers. The PCC and base modulus values were determined for bonded and unbonded interface conditions. All three programs were executed in a batch mode process on a State-by-State basis to handle the computational effort needed for the large volume of deflection basins in the LTPP database. The BEST FIT method provides unique solutions for PCC-surfaced pavements using a three-layered structure. The EVERCALC and MODCOMP analyses were performed in four main analysis phases. Each phase progressively identified and filtered out those cases with poor quality results and made appropriate adjustments to the analysis parameters to improve the convergence in the subsequent phase. The first phase included all LTPP data, while the second phase used a subset from the first phase. The third and fourth analysis phases, if required, used a subset from the second phase. Phases 1 and 2 used EVERCALC, and phases 3 and 4 used MODCOMP. The backcalculation methods and procedures, including the pre- and post-processing tools, were automated to minimize manual errors and enable independent users (those not directly involved in the development of the tools and procedures) to recreate the results. In addition, the automation process was designed to enable users to generate results for additional data collected by LTPP in the future. A user's manual and source code were prepared for all software packages and tools that were modified, revised, or developed as a part of the backcalculation project. In addition, source codes were prepared for each of the pre- and post-processing utility tools used in the backcalculation process. Source codes were not prepared for any unchanged program that was already available in the public domain. Perform general data validity checks. Use the original LTPP tables to merge deflection, sensor spacing, and temperature data. Establish data flags to filter out problem basins (i.e., those with non-decreasing deflections, missing deflection data, or missing sensor spacing data). Missing temperature data were flagged but not discarded for backcalculation. Process pavement layer information from raw data in LTPP tables to develop backcalculation structure suitable for use in the EVERCALC program. This process involved combining pavement layers to reduce the pavement structure to an equivalent backcalculation layer structure meeting EVERCALC requirements. Assign reasonable seed modulus values and a range of modulus values for use in the backcalculation process. Generate the input files in the format necessary for use in the EVERCALC program. Generate input files in the format necessary for use in the MODCOMP analyses. Because the MODCOMP analyses followed EVERCALC, the input files for MODCOMP were created by modifying the EVERCALC input files. Generate the input files in the format necessary for the BEST FIT analyses program. These files were created directly from the Access data tables and were independent of the EVERCALC or MODCOMP analyses. Execute the EVERCALC analyses in a batch mode. Execute the MODCOMP analyses in a batch mode. Execute the BEST FIT analyses in a batch mode. Calculate the load transfer efficiency across the transverse and longitudinal joints in jointed plain concrete pavement sections and across transverse cracks in continuously reinforced concrete pavement sections. Read output data files, merge results, and compute summary tables for inclusion in the LTPP results database. The macros were developed in Microsoft® Access primarily because the raw data resided in Microsoft® Access tables. The macros were used to perform the preliminary data checks and create supplementary data tables. Supplementary data include all data other than the raw FWD deflection data that are necessary to perform the backcalculation analyses, including sensor spacing; temperature data; backcalculation layer structure and layer thicknesses; layer material information, including specified ranges for EVERCALC analysis; and beta factors for the BEST FIT analysis methods. A standalone software program, Back Calculator, was developed for bulk processing and filtering the deflection data, executing EVERCALC and BEST FIT programs, and processing the backcalculation results. Figure 1 shows a simplified flowchart of the Back Calculator program using the EVERCALC software package. MODCOMP analyses were not included in this program because only a limited number of sections were analyzed using MODCOMP. MODCOMP analyses were performed in a batch mode by executing the application file from an MS-DOS® prompt. Figure 1. Chart. Simplified flowchart for the Back Calculator program using EVERCALC as the backcalculation software package. Another factor included in the automated process for evaluating the acceptability of the results was to determine whether the calculated elastic layer moduli are characteristic of a normal distribution. Nearly all volumetric and structural properties exhibited a normal distribution unless some type of bias was created during construction or a boundary condition. Thus, results from a single test day were evaluated to determine whether those results exhibited a normal distribution. The verification for normal distribution was performed using the Jarque-Bera test statistic, which asymptotically has a chi-squared distribution with 2 degrees of freedom. 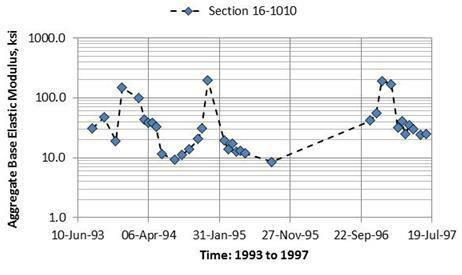 The deflection data were extracted from LTPP Standard Data Release 27.0 and included specific data from all LTPP test sections for all days of deflection basin testing. The data needed for the backcalculation of layer modulus values were grouped into two categories: direct and indirect. The direct data were from those tables needed to establish the inputs for the backcalculation and forward calculation of layer moduli, and the indirect data included were from tables needed to evaluate the results from the backcalculation process. The direct data elements were extracted from the LTPP database for all test sections on an experimental basis. The indirect data elements were extracted for those test sections that had an appreciable number of results that were considered unacceptable to identify potential reasons for the unacceptable or poor results. Deflection basins considered acceptable for backcalculation: 5,847,770. Deflection basins considered unacceptable for backcalculation: 195,709. Total deflection basins with backcalculated elastic layer moduli: 5,662,494. Nearly 97 percent of all deflection basins were considered acceptable for backcalculation. This high percentage is a testament to the LTPP quality control procedures. Slightly fewer of the data were reported with backcalculated moduli because of a lack of convergence in the backcalculation analysis and missing critical data elements. In addition some of the acceptable basins were borderline. Of the deflection basins included in the backcalculation process, 4,311,814 resulted in elastic layer moduli that met the acceptance criteria, for a slightly more than 76 percent success rate. More importantly, some 75 to 90 percent of the deflection basins measured along most of the LTPP test sections exceeded the acceptance criteria. The following sections provide some examples of how the results can be used related to pavement design and rehabilitation, as well as research topics that can be tackled with this data. Figure 2 and figure 3 illustrate the change in the AC modulus over time for two LTPP test sections in Minnesota. 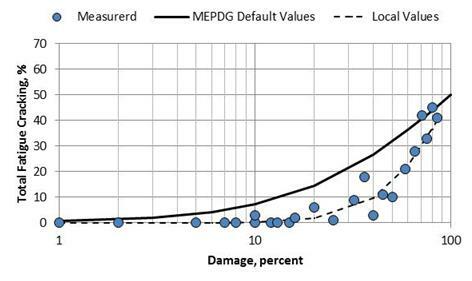 These data can be used to determine the in-place damage for rehabilitation designs and forensic investigations, as defined by the MEPDG. (1) Figure 2 shows no damage for test section 27-1018, while figure 3 shows damage in the later years of testing for test section 27-6251. The backcalculated elastic moduli can be used to confirm or reject the concept included in the MEPDG for rehabilitation designs in determining the in-place damage of bound layers. In addition, the backcalculation results can be used to determine the temperature-modulus relationship of various hot mix asphalt (HMA) mixtures. Figure 2. Graph. Minnesota section 27-1018. Figure 3. Graph. Minnesota section 27-6251. Table 2. Average PCC elastic layer moduli before and after fracturing, Oklahoma SPS-6 project. 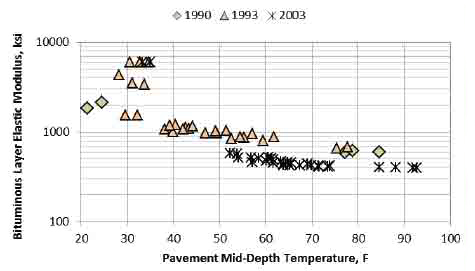 Figure 4 shows the elastic modulus of the fractured PCC slabs from the crack and seat and rubblization methods used in rigid pavement rehabilitation in comparison with the intact PCC slabs for the Michigan SPS-6 test sections. The backcalculation data can be used to determine the default modulus values at the time of rehabilitation and define how those values change over time. Figure 4. Graph. Michigan SPS-6 project. More importantly, the current version of the MEPDG assumes that these modulus values remain constant over time. The backcalculation data can be used to confirm or recommend changes to that hypothesis. Figure 5 shows the change in elastic modulus over time from the Idaho Seasonal Monitoring Program (SMP) test section. The backcalculation data can be used to estimate the effect of seasonal factors on the response of different unbound aggregate base layers, as well as for the subgrade soils and embankments. Another important application of the backcalculation data is to define characteristics of the deflection basin that can be used to identify subsurface features that could have a significant impact on the rehabilitation or reconstruction project. Figure 5. Graph. Idaho SMP project. Figure 6 compares the elastic modulus of different HMA mixtures (with and without reclaimed asphalt pavement (RAP)) in the Minnesota SPS-5 project for flexible pavement rehabilitation. The backcalculation data can be used to compare the load-response characteristics between different mixtures, which can be compared with laboratory-measured dynamic values in determining whether there will be any significant difference in performance. Most of the SPS-5 projects exhibit no significant difference between the in-place elastic modulus values for mixtures with and without RAP. Figure 6. Graph. Minnesota SPS-5 project. The backcalculated elastic layer moduli and fatigue cracking data were used to determine the coefficients of the fatigue cracking transfer function independent of executing the MEPDG software. The coefficients from this relationship were found to result in no bias between the predicted and measured fatigue cracking. Confirmation of this concept and determination of the coefficients independent of the software reduces the amount of field work and materials testing required for local calibration. More importantly, confirmation of this damage concept permits agencies to make more use of their deflection basin data for rehabilitation design in day-to-day practice, as well as in selecting and planning preventive maintenance type projects. Figure 7. Graph. Georgia LTPP test sections used in local calibration. Over 76 percent of the deflection basins analyzed with EVERCALC and MODCOMP resulted in layer moduli with an RMSE less than or equal to 3 percent and layer moduli within an expanded typical range of modulus values. There is no consensus on the â€œbestâ€� backcalculation package that provides the most reliable and accurate results. Nonetheless, the findings from the backcalculation project were similar to the findings documented in a previous study. (7) Specifically, EVERCALC consistently resulted in lower error terms and a higher number of successful modulus determinations when considering all deflection basins. When only considering those deflection basins that ran successfully, however, the MODCOMP program resulted in lower RMSE values. It should also be noted that the MODCOMP program was used only for sections that were resulting in poor RMSE values from the EVERCALC analysis. The use of four layers generally resulted in lower RMSEs than the use of three layers. In many cases, separating the subgrade into at least two layers improved the match between the measured and calculated deflection basins. EVERCALC and MODCOMP resulted in statistically indifferent results for deflection basins classified as typical or in conformance with elastic layer theory as defined by Von Quintus et al. (5,8) For type 2 deflection basins, the EVERCALC and MODCOMP programs resulted in statistically different elastic moduli for the intermediate layers (the weathered soil layer and thinner aggregate base layers, which accounted for about 25 percent of the deflection basins analyzed). The pavements exhibiting deflection-softening behavior with type 2 deflection basins were the most difficult to analyze and were generally found to have higher RMSEs. Some of these deflection basin analyses resulted in no reasonable solution, or the solution provided unrealistic layer moduli for the type of material defined in the LTPP database. Unrealistic is defined as the resulting moduli values being outside the expanded typical range for at least one of the layers within a test section. The PCC elastic moduli calculated with EVERCALC resulted in significantly greater values than the moduli calculated with the BEST FIT unbonded method. Thus, results from the two methods should not be combined, or a factor needs to be used to adjust the EVERCALC-generated PCC moduli to the BEST FIT unbonded condition method or laboratory-measured elastic moduli. Historically, a constant modulus for the PCC rubblized slabs has been used for rehabilitation design projects. However, the elastic modulus of the rubblized PCC slabs was found to steadily increase over time for some of the LTPP SPS-6 test sections. No consistent difference was found in the load-response properties (stiffness) between the RAP and virgin mixtures of the SPS-5 experiment. Similar c-factor values were found in this project to the values included in the MEPDG. (1) More importantly, no significant difference or bias was found between the laboratory-derived dynamic modulus and the field-derived values for the AC layers. The use of drop heights one through four in the LTPP deflection testing program did not result in significantly different elastic moduli for the unbound layers. As such, it was difficult to determine the coefficients of a constitutive equation to estimate the stress sensitivity of an unbound layer because of the variation in moduli over time and along a specific test section. The stress levels resulting from the four drop heights used in the LTPP deflection testing program are simply too narrow. Damage was determined in accordance with the MEPDG procedure for multiple LTPP test sections to demonstrate its use in rehabilitation design. (1) The results were positive and were used to support the MEDPG procedure. The damage concept as applied to interpreting the backcalculated moduli can be useful in explaining low moduli. The Florida Department of Transportation was one of the first agencies to monitor changes in the deflection basin (similar to this damage concept) over time in planning rehabilitation projects from a pavement management standpoint. From the case study sites and examples of data use, the damage concept can be used to evaluate the condition of the existing pavement and plan future rehabilitation projects. AASHTO, Mechanistic-Empirical Pavement Design Guide-A Manual of Practice, American Association of State Highway and Transportation Officials, Washington, DC, 2008. Khazanovich, L., Tayabji, S.D., and Darter, M.I., Backcalculation of Layer Parameters for Long-Term Pavement Performance (LTPP) Test Sections, Volume I: Slab on Elastic Solid and Slab on Dense-Liquid Foundation Analysis of Rigid Pavements, Publication No. FHWA-RD-00-086, Federal Highway Administration, Washington, DC, December 2001. Stubstad, R.N., Jiang, Y.J., and Lukanen, E.O., Guidelines for Review and Evaluation of Backcalculation Results, Publication No. FHWA-HRT-05-152, Federal Highway Administration, Washington, DC, February 2006. Stubstad, R.N., Jiang, Y.J., Clevenson, M.L., and Lukanen, E.O., Review of the Long-Term Pavement Performance Backcalculation Results, Publication No. FHWA-HRT-05-150, Federal Highway Administration, Washington, DC, February 2006. Von Quintus, H.L. and Simpson, A.L., Backcalculation of Layer Parameters for LTPP Test Sections, Volume II: Layered Elastic Analysis for Flexible and Rigid Pavements, Publication No. FHWA-RD-01-113, Federal Highway Administration, Washington, DC, October 2002. Von Quintus, H., et al., Implementation of the Mechanistic-Empirical Pavement Design Guide in Georgia, Draft Final Report Number FHWA/GA-014-11-17, Georgia Department of Transportation, Atlanta, GA, November 2014. Smith, K.D., et al., Using Falling Weight Deflectometer Data with Mechanistic-Empirical Design and Analysis-Volume 1: Final Report, Federal Highway Administration, Turner-Fairbank Highway Research Facility, McLean, VA, December 2010. 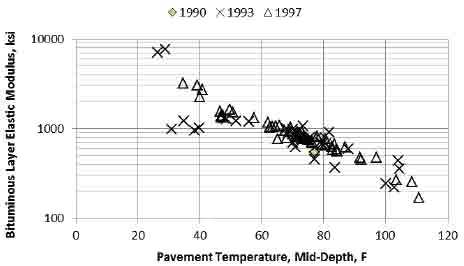 Von Quintus, H., and Killingsworth, B., Analyses Relating to Pavement Material Characterizations and Their Effects on Pavement Performance, Publication No. FHWA-RD-97-085, Federal Highway Administration, McLean, VA, January 1998. Researchers—This study was performed by Applied Research Associates Inc., Contract No. DTFH61-11-C-00051. Distribution—his TechBrief is being distributed according to a standard distribution. Direct distribution is being made to the FHWA Divisions and Resource Center. Availability—The report will be available in 2015 and may be obtained from the FHWA Product Distribution Center by e-mail to report.center@fhwa.dot.gov, by fax to 301-577-1421, or by phone to 301-577-0818. Key Words—Backcalculation, deflection data, elastic modulus, Falling Weight Deflectometer, Long-Term Pavement Performance, MODCOMP, MODTAG, Mechanistic-Empirical Pavement Design Guide, EVERCALC.